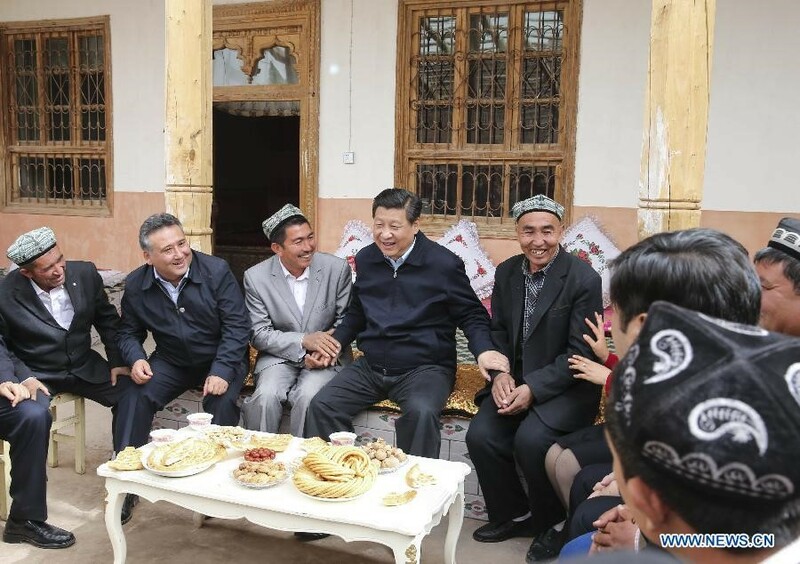 Xi Jinping sits down with ethnic Uyghurs in a traditional Uyghur home. Disclaimer: The greater part of this article seeks to convey the words, views, and behaviors of ethnic Uyghurs residing in both China proper (“inner China”) and China’s Xinjiang Uyghur Autonomous Region, as observed by the author over the previous year and a half. So as to protect the people mentioned, I have intentionally obscured or changed the relevant names, locations, and times, as well as any other details that could aid in fixing a given person’s identity. Quotes from individuals are from unrecorded conversations, in Uyghur, and as such are subject to some corruption due to both imperfect memory and translation. While this admittedly runs the risk of vague reporting, I do believe that the essential has been preserved and thereby hope for the reader’s understanding. It was about a year ago that I first walked into Karim’s restaurant, intending to write about it as part of the food guide I was putting together about Uyghur restaurants in inner China. While my travels for this project would result in my visiting close to 200 restaurants in over 50 Chinese cities, Karim’s was one that left a particularly good impression. The excellent spicy pilau aside, there was a certain warmth and feeling of community there that made sitting around for an additional hour or two a real pleasure. Karim was a great host, and the clients would often engage in inter-table chats that touched upon important, topical issues while maintaining a certain levity and humor. During one of my visits, the conversation turned to the topic of discrimination – namely, the discrimination that the Uyghurs faced in this large Han-majority city. A major example brought up by several of the clients was finding accommodation, as local hotels frequently rejected Uyghur visitors by claiming that there were no rooms available. Even an Uyghur policeman had been denied a room, someone pointed out with a laugh. Karim, a worldly polyglot who could have easily passed for a Middle Easterner, told of how he’d sometimes go to a hotel and speak to the front-desk staff in English. Mistaking him for a foreigner, they’d tell him that there were rooms available, and then backtrack after asking him for his documents and seeing the word “Uyghur” on his Chinese identification card. Sitting down across from me, he told me a story from another group that has long complained of discrimination and racism in China: the African community. There had been, as he put it, an incident on a Chinese metro where a black person had been called a hei gui (“black devil”) and retaliated by hitting the offending party repeatedly. The story made international press and improvements to the city’s legislation vis-à-vis the discrimination issue followed, Karim claimed. He then asked me if I knew of any good ways to get in touch with news outlets like the BBC, so that a similar outcome might be achieved for the city’s Uyghur population, but ultimately decided that contacting foreign media was probably too risky, given the potential retaliation from the state. As would soon become clear, however, such “mild” discrimination was to be the least of the Uyghurs’ problems. While Karim and I were having this conversation in the spring of 2017, his home region of Xinjiang – home to over ten million ethnic Uyghurs – was already being subjected to a sudden “all-out offensive” against what the Chinese state claimed to be terrorism and religious extremism. The coming year ran the gamut of repression: the whole of Xinjiang was turned into a police state where every aspect of the Uyghurs’ lives was monitored, and a potential one million Uyghurs were gradually locked away in concentration camps, thrown in prison, or “disappeared”. Witness reports of life inside the camps and detention centers have told not only of unhealthy living conditions but also of regular violence, torture, and brainwashing. Tender bids and job offers seem to indicate that new camps are still being built. In its thoroughness, the state has also made a strong effort to bring the Uyghurs residing outside of Xinjiang back in, with many living in inner China or abroad ordered to return to their hometowns. The parents and relatives of Uyghurs overseas have often been detained and held hostage to deter noncompliance. For many, the spring of last year would mark the start of a period of great loss, as people lost their rights, their livelihoods, their identities, and their basic freedoms. Some would also lose their lives, as Karim did. At least, that’s the politically proper way of putting it. Depending on where you stand, you might prefer to say that he was systematically murdered by the state. Belonging to an especially imperiled demographic – Uyghurs who had legally visited or lived abroad in Muslim-majority countries in the past (Karim had lived in three) – he would one day find himself handcuffed, taken away, and jailed. So I was told when I visited the neighborhood again recently, just before being told that he had “died after prolonged heavy labor”. Or you might prefer to deny the whole thing altogether. Firm denial is, after all, what attempts to confront the Chinese state about these issues have been met with. In the summer of last year, Xinjiang’s deputy foreign publicity director, Ailiti Saliyev, essentially stated that “the happiest Muslims in the world live in Xinjiang”. Then, in a statement earlier this year, China’s Foreign Ministry spokeswoman, Hua Chunying, went on to say that “everyone can see that people of all ethnicities in Xinjiang live and work in peace and contentment and enjoy peaceful and progressing lives”, while suggesting that concerns about the mistreatment of the Uyghurs were “unjustified criticisms” and “interference in China’s internal affairs”. Diplomatic invitations to discuss the issue have been rejected. Again, depending on where you stand, you may choose to call these statements different things – from “correct” to “uninformed” to “outright lies” – and a global consensus appears slow in coming. I would ask, however, that everyone agree on this: in such subjective matters as happiness, it is probably best to let the Uyghurs speak for themselves. Unfortunately, hearing their voices has been a challenge, given the state’s silent but determined efforts to turn Xinjiang into an information vacuum. In addition to many Uyghurs being forced to return to Xinjiang or having their relatives held hostage so that they don’t speak out – with the relatives jailed when they do – there have also been measures, direct and indirect, to make it difficult for foreigners in China to engage regular Uyghur people in any kind of conversation. Journalists, in particular, have been under very heavy scrutiny, with anyone they’ve managed to interview often too scared to speak normally and honestly. Of the foreign tourists in the region, a large number that I’ve talked to this year have told of being interrogated on the train into Xinjiang, as well as at other checkpoints between different cities. One friend told me of being taken to a police station minutes after setting foot into an Uyghur home last fall, in what he memorably dubbed as “4 minutes of tea, 4 hours at the station”. Two academic scholars told me stories of being denied entry or transportation to towns that have traditionally been accessible, without being provided any real reason for the denial. One long-term Xinjiang resident was interrogated for two weeks, prior to being banned from China completely. By 2018, even informal chats had turned into a moral dilemma – talk to your Uyghur acquaintance for a minute too long and there is the risk that the police will come knocking, not on your door but on theirs. Concerned about their own safety, many Uyghurs have deleted most, if not all, of their foreign friends and contacts on China’s (highly monitored) WeChat app, with more secure foreign apps having long ago stopped being an option, following repeated crackdowns on the VPN software required to use them and the forced placement of government spyware on Xinjiang residents’ mobile phones. Telephone calls to and from abroad have also become dangerous. In interrogations, it seems to have become routine for police to ask foreigners about their local Uyghur friends or contacts, together with their names and phone numbers. In the same vein, any special mention of the words “Xinjiang” or “Uyghur” to Chinese authorities is an almost surefire way to invite scrutiny or hours of questioning. Put these words on your Chinese visa application form and you run a pretty good risk of having your application rejected, as has happened to entire tour groups last year. For me personally, the authorities went so far as to chase me out of the city of Kashgar in late April, by first employing the “fire safety” excuse to close the entire hostel where I was staying and then blacklisting me at every other place that could have offered me accommodation. My subsequent daily contact with the Uyghurs in the city of Yiwu, an international trade hub some 4000 kilometers away from Xinjiang, invited special attention as well. On two occasions, the local police warned me to “obey Chinese law” and to “not go hanging out with any bad Xinjiang people” (a euphemism for Uyghurs). But warn me as they may, the great majority of my past year and a half was spent precisely among those “bad Xinjiang people”, with 3-4 months in Xinjiang and the remainder in inner China’s Uyghur restaurants. If I were to guess, I’d say that the number of Uyghur individuals that I conversed with over this time ranged anywhere between 1000 and 2000, the majority of them male and employed as restaurant workers, business owners, businessmen, small-time traders, and street-food cooks (plus their family members). In the vast majority of cases, we did not talk about politics – a taboo subject that had nothing to do with my largely linguistic research. That said, almost everyone I talked to was significantly affected by the repression in Xinjiang, and sometimes the only alternative to talking about it was not talking at all – and so we talked. In many cases, and over the past few months especially, these conversations found me. In synthesizing what I have observed, I realize that I ultimately cannot speak for the Uyghurs – that task should still be left to the Uyghurs themselves, in an environment that is free of fear. Still, I hope that the image I present will be insightful, even if imperfect, and will allow the reader an important glimpse at how the Uyghurs in both Xinjiang and China at large are reacting to the present situation. On a certain alley off a certain street in a certain city in Xinjiang stands a certain diner that I particularly fancy, reputed for its pigeon shish kebab and milk tea. I always try to stop by there if in the neighborhood, though the last time I did I came apologetically, having been absent for far too long. “I was sure that you had gone back to your country,” the surprised owner told me. Inviting me to take a seat at a table, he put down his QR-coded knife and came over to join me soon after. Some eleven months had passed since our previous meeting, and a lot of things had changed. The great majority of his staff, about ten in all, had been forced to return to their hometowns in southern Xinjiang, either for “re-education” or for “hometown arrest”, which had left him shorthanded and dependent on the help of friends and relatives. Gone were the shish kebab and the tea, together with the clientele, as a place that had always brimmed with people was suddenly empty. Time and again I’d watch potential customers come in, ask what was available, and then leave because of the lack of options. Uyghur kitchen staff, as the owner put it, were extremely scarce now, and it was close to impossible to find substitutes. “Our mood is shot,” he admitted to me. Having already spent a few months in Kashgar, I knew precisely what he meant, just as I knew that the “our mood” referred to all the Uyghur people, and not just his family. Though afraid to know the answer, I asked him where his nephew was, as the other had often helped out at the diner in the past. He was in jail, I was told, for having previously spent a year in a Middle Eastern country. “Our mood is shot,” he admitted to me. Having already spent a few months in Kashgar, I knew precisely what he meant, just as I knew that the “our mood” referred to all the Uyghur people, and not just his family. After all, all that it took was a pair of human eyes to see the mass depression that Xinjiang’s legions of red mechanical ones failed to. You could see it in how the people stared into space, in their forlorn expressions, in their general languor. More abstractly, you could feel its crushing weight in the air, at times so disorienting that even I – a foreigner protected from the repressions – would hesitate to venture outside, for the fear of being overwhelmed by this invisible force. Police vans with sirens blaring trolled the streets incessantly. In the past, I would take to the Kashgar streets to almost always be approached by a mentally ill Kashgarian acquaintance, who would run up to me, shake my hand – his fly sometimes open – and ask me the same questions over and over, a big smile on his face. But somehow the situation warped even him, as last fall he suddenly stopped rushing over to me, remaining quiet and still on his bench when I passed by. Eventually, he would disappear from the streets completely. The poor mood was also evident in the frank negativity that I noticed in many Uyghur business owners last year. While it is not considered good Uyghur etiquette to tell somebody of your complaints and troubles when they ask you how you’re doing – it is more proper, instead, to say that you’re doing well – more and more often I would put the “how are you doing?” question to people to be met with a “not that great, business is horrible”. Running into a tour guide acquaintance last year, I remarked to him that he had gotten really thin since I had last seen him a year earlier. “We’ve all gotten really thin this past year!” he told me. Though more localized, that depression was something I also felt while visiting certain restaurants in inner China. Once, I walked into a small shack of a diner, forcing the lady owner to get out of bed and make me something. While I ate, she asked me if I was a reporter. I told her that I wasn’t, but still she went on to tell me her family’s story. Just a few months earlier, she said, they were the owners of a number of successful Uyghur restaurants in that city, but were now reduced to life in this shack, the majority of the staff having been forced to return to Xinjiang. She, her husband, and their kids had gotten to stay because the local police had vouched for their “trustworthiness”. The modest interior, rainy weather, and resignation in her voice all made her story particularly hard to forget, but as a story it was far from rare. Of the two hundred or so restaurants in inner China that I’m familiar with, at least a sixth have had to shutter up this past year because of the lack of staff, clients, or both. Going hand in hand with the overwhelming depression is the overwhelming fear, which is not surprising given the often blind and quota-driven nature of the detentions and the total absence of legal protection, with lawyers forbidden from pursuing an innocence defense for Xinjiang detainees. Having witnessed the system in action, I can personally vouch for its swift brutality. The hardest to forget, I think, is that one time I was walking home on a Kashgar evening. Walking in the opposite direction was an Uyghur family of three – a middle-aged husband and wife with their twenty-something son. The father was drunk, waving his arms around while his wife and son supported him. As a police minivan materialized at the end of the street, the wife told him to be still, but he wouldn’t. And so the van stopped, five or six police jumped out, grabbed the man without asking any questions or asking for ID, and then drove him off together with his wife, the son left alone on the street. The whole thing couldn’t have lasted more than two minutes. In inner China, I witnessed a quieter version of something equally insidious, as young male restaurant workers, seemingly relaxed and getting by one day, would suddenly become visibly worried the next, having received orders from the police to go back to their hometowns in Xinjiang immediately (a 3-4 day train journey for most). On one occasion, a cook was asking me for advice on which restaurant to work at next – having obtained permission to leave Xinjiang two months earlier, he had tried several places but didn’t end up settling at any of them. Listening to my recommendation, he decided to buy a train ticket for a big coastal city for the following day. However, just some three hours later he would write to me again to say that his hometown police had called. Because he had yet to find a stable job, they wanted him to return as soon as possible and “obtain permission again”. The train he’d get on the next day ended up being Xinjiang-bound. People like him, without money or connections, remain at the absolute mercy of the system, but as time has shown not even wealth or fame can provide guarantees. Even some owners of the relatively successful restaurants I visited have been forced to pack up their things and return to Xinjiang for an indefinite period of time. A fear that would be funny if it weren’t so sad is the fear of religious names. In Xinjiang, one friend went so far as to change his because it had the word “Hajim” in it – a practice previously enforced by the government for children only. On another occasion, a shop owner took an Uyghur book that I was reading, flipped it to a random page, found the word “Hajim” there, and quietly told me that people got locked up for five or ten years now for having books with this word in it. The mass WeChat deletions of foreign friends and contacts are the online manifestation of the fear. One friend claims to have deleted over 400. Another has gone back and forth between adding me and deleting me, before finally deleting me for good and leaving any groups that we were in together. Uyghurs living or studying abroad have also reported being deleted by their Uyghur friends and relatives back in Xinjiang, which – coupled with the danger of calling – has essentially made it impossible for people to support each other during very frightening times. There were times during the conversation when I felt like he was on the verge of tears. To be frank, so was I. In southern Xinjiang, a friend pulled me into his shop to tell me very succinctly that it wasn’t safe for him to talk to foreigners anymore. In the weeks that followed, we would exchange greetings only through body language, then only through eye contact, and then would ultimately ignore each other completely. Once, I sat down with a manager of a restaurant in eastern China. Unable to avoid the topic, I shared with him how oppressive things had gotten in Xinjiang, recounting to him a particular story of a friend who had been sentenced to a decade in jail for the apparent crime of owning the “wrong” books. No sooner did I say the word “jail” than his head began to twitch really strangely, in the direction of the table behind ours. “There’s a policeman here!” he whispered, before standing up and walking away. Elsewhere, I had a fairly honest conversation with the restaurant staff about the situation in Xinjiang, but was nevertheless reminded to be careful with what we said, because “the walls too have ears”. Sometimes the fear was just under the surface, and I still think back to the laid-back, confident jade seller who once approached me to ask, uncharacteristically nervous, if I had seen one of our mutual acquaintances recently. He hadn’t seen him around in two days, he told me, and was worried that something might have happened. Fortunately, this was one of the rare cases when nothing had – that particular acquaintance was still around and we’d see him soon enough. For many, the situation in Xinjiang is an elephant masquerading as a mouse, whose presence is tacitly acknowledged but whose identity is frequently obscured. When talking about it becomes inevitable – for example, when someone unwittingly asks about a person who’s been sent to Xinjiang, to camp, or to jail – it is standard to use euphemisms. The most common by far is the word yoq, which here may be translated as “gone” or “not around”. The phrase adem yoq (“everybody’s gone”) is probably the one I’ve heard the most this past year, and has been used to describe the absence of staff, clients, and people in general. To refer to people who have been forced to return to their hometowns (for hometown arrest, camp, or worse), it is typical to say that they “went back home” – more specifically, people in inner China might say that they “went back to Xinjiang”, while people in northern Xinjiang might say that they “went back to Kashgar”. The concentration camps are not referred to as “concentration camps”, naturally. Instead, the people there are said to be occupied with “studying” (oqushta/öginishte) or “education” (terbiyileshte), or sometimes may be said to be “at school” (mektepte). I once even heard an older man refer to some friends as “being at university” (dashöde), though this was not understood by the people he was talking to as that euphemism was not very standard. Likewise, when talking about the overall situation in Xinjiang, people do not use words like “oppression”. Rather, they tend to say weziyet yaxshi emes (“the situation isn’t good”), or describe Xinjiang as being very ching (“strict”, “tight”). In three different restaurants, a cook told me bluntly that “there are no people left (adem yoq)” in southern Xinjiang villages, an owner lamented how the absence of workers was killing his brand new business that he had invested so much into, and a manager asked me if many of the Uyghur restaurants I had visited were still open. It hit me just how pervasive the topic was when, while chatting with an old friend in inner China, I made a genuine effort to avoid politics and talk about more “normal”, even mundane, things. It proved impossible. When I asked him what he did earlier that day, he brought up a political meeting that all the Uyghurs in that city had to attend. When I asked him if he still tried to read books in his spare time, he told me that the police had cracked down on that in inner China as well, and that him reading any book at all would invite suspicious and unwanted attention from the authorities. When I asked him what his aspirations for the future were, he told me that ideally he would love to become a proper Turkish-food chef and open up his own Turkish restaurant, but unfortunately that act alone would get him jailed in Xinjiang, as the state continues to discourage and destroy all contact between the Uyghurs and other Turkic and Muslim peoples abroad. Still, not even he was ready to directly criticize what was happening. “When we talk about it, we say that everything is good,” another acquaintance, a cook, summed it up for me, a week before he too went yoq, having “gone back home”. On a few occasions, I encountered people who – for some reason or another – seemed to have reached a degree of desperation where they just wanted to say everything. There was little in the way of self-censorship in these cases. The first such instance was in Kashgar, in the fall of last year, when a uniformed bao’an (public-security worker) – the mostly Uyghur, lowest-rank uniformed authority in southern Xinjiang towns and cities – invited me to sit across from him at a table in a teahouse. He was off that afternoon, having just returned from an encouraged medical check-up. He was not going to let me off with such a noncommittal answer, however. Given my general distrust of uniformed people in China – be they Uyghur, Han, or any of the other 54 ethnicities – I wasn’t ready to openly lay any political views on our table, as these could then be reported to his superiors. However, I’ve now come to see it as a true moment of desperation, and am ready to believe that his words were genuine. He would disappear a few days later, and I wouldn’t see him at his post, not far from Kashgar’s night market, ever again. The other occasion that will remain forever in my mind took place in inner China, while paying a visit to a restaurant that I had already been to a few times in the past. With the exception of a single waiter, almost all of the old staff were gone, and no sooner did he see me than he dropped everything to sit down across from me and chat. My telling him that I had been kicked out of Kashgar seemed to trigger him, and he would go on to say a whole bunch of things about the situation there, virtually all of them taboo. He told me about how “millions of Uyghurs” were being held in camps, about how they were being fed 15-year-old leftover rice, and about how they were subject to beatings (while the rice claim has yet to be verified, witness testimonies have confirmed both poor nutrition and violence in the camps). He told me of how the Uyghurs in this inner-China city now had to attend political meetings and how they might have to take a test on things like the 19th Party Congress soon, with those who didn’t pass being sent to Xinjiang. China as a country had been weak before, he said, but now that it was stronger it was making its full-out offensive against the Uyghurs. When I mentioned to him the possibility of the U.S. taking measures against China under the Global Magnitsky Act, he said that he wasn’t expecting the U.S. to help the Uyghurs, since the U.S. only did things that “benefited the U.S.”. Obama’s administration had already let him down in that regard. He also talked at length about the intense scrutiny that the local authorities subjected the Uyghurs to, using any pretext they could to arrest or sentence a person. My waiter friend would also tell me of there being distrust among the Uyghurs themselves, and among the Uyghur restaurant staff, which I assume originated from the arbitrary nature of the detentions and the fact that even the individual restaurants seemed to be subject to quotas, with at least a certain percentage of the Uyghur staff doomed to go in the near future. I worried about him talking to me so openly, at a table for two in a mostly empty interior, but I feel like he understood the risks perfectly well, or had already concluded that he was going to be taken soon anyway. I also suspect that I was that one in a thousand whom he could actually talk about this to – the Han being out of the question, the Uyghurs and the other minorities being hard to trust, and the other foreigners simply too unaware of what was happening in Xinjiang or of who the Uyghurs even were. When another crackdown came a week later and swept a good chunk of the city’s Uyghur youth with it, he would be among those forced to leave. “Back to his hometown”. There was also a third conversation where I clearly sensed a desperation in my interlocutor. A famous owner, manager, and director with an outstanding résumé, he had recently opened a restaurant but was now reduced to running it with his wife, the other staff all having returned to Xinjiang. It felt like talking to a broken man. Our very honest conversation would take an ironic twist, however, as he would conclude by saying that the policies were ultimately going to be beneficial. The Uyghurs detained now would be more successful in modern China, he told me, after they came out of “re-education” with improved skills and better Mandarin proficiency. The Uyghurs, he said, were traditionally not very educated. Indeed, it would be inaccurate to say that absolutely none of the people I talked to had anything good to say about the situation, and I did encounter some positive comments about the policies occasionally. At the risk of passing off my subjectivity as fact, I will say, however, that the vast majority of these struck me as a mix of cognitive dissonance, the Stockholm syndrome, and self-delusion, often evidenced by self-contradiction and a lack of genuine conviction behind the words. The words, which almost sounded prepared, stunned me. He then went on to say that this was all to protect the people from terrorism, and that as soon as Russia and the U.S. hurried up and defeated ISIS, all of this would be over. However, when I shared with him my opinion that terrorism could not be defeated with force like this, he was quick to agree with that as well. On some occasions, I saw a strong – and perhaps genuine – support for China’s ruling party. In one northeastern-China restaurant I visited, the boss asked me if I had read Xi Jinping’s book (The Governance of China). He was reading a news article on his phone that said that it was taking the world by storm. I contradicted him: no, it wasn’t, I said. He then showed me the Uyghur-language news story, which had a photo of a Caucasian man looking at the book in a bookstore. To him, this was sufficient proof, but I insisted that the news source wasn’t credible. My “unpopular” opinion seemed to put me at odds with him, his wife, and some of the restaurant’s staff, and I would part with them on awkward terms. Earlier, the same boss had also complained about how investing in a big-scale Uyghur restaurant was just too risky given the current situation, but would still tell me that he thought Xi Jinping was governing “like this!” (giving a big thumbs up). Another friend at another restaurant in another city complained to me about the arbitrary inspections that the local police carried out with regard to the Uyghurs. I still remember how angry he got as he talked – saying that the individual policemen acted like they were the law – but nevertheless added that the upper layers of the government were good. Once, an aged store owner in Xinjiang was quick to praise the fact that he no longer had to take strong precautions with protecting his merchandise at night – because of there being cameras everywhere, there were “no more thieves”. But then we got to talking about his son, who was now living in inner China. I told him that it was a good thing that he was there and not in Xinjiang, and that it would probably be better that he stayed there. The old man laughed approvingly. A traveling businessman I talked to in Xinjiang last fall didn’t seem to understand why I asked him if it was safe for him to add me on WeChat. When I told him, quietly and euphemistically, that the “situation was not good right now” (weziyet yaxshi emes), he shook his head and said that he didn’t know much about any of that. It was a rare and puzzling thing to hear. When I saw him again this year, however, he was telling me that he would no longer travel to southern Xinjiang on business, as all the towns were empty (adem yoq) and there was no business to be done. He was going to try his luck in northern Xinjiang, he said. A somewhat comical instance that still remains in my mind is how a certain jade seller, while discussing the “strictness” of Xinjiang’s policies with other Uyghurs at an inner-China restaurant, generally lauded them but then added that “they might have gone just a little bit overboard”. More sad than comical were the displays that took place online at the time of the 19th Party Congress, when Uyghur friends who hardly spoke any Mandarin suddenly started posting long messages in fluent Mandarin praising Xi Jinping and the Congress. A few months later, I also heard of there being a WeChat applet that easily allowed someone to fasheng liangjian (“to clearly demonstrate one’s stance” or, literally, “to speak forth and flash one’s sword”), plugging their name into a prepared Mandarin- or Uyghur-language statement that pledged one’s loyalty to the Communist Party and its leaders, promised to uphold core socialist values, and expressed – among other things – one’s determination in upholding “ethnic harmony” while standing opposed to radicalism. The generated image file could then be readily posted on their social network of choice as a show of loyalty. In many of the inner-China restaurants I visited, this loyalty was much more visual than verbal, the Uyghur restaurants being the only ones on their streets covered with Chinese flags and, occasionally, red banners proclaiming a determined struggle against terrorism. Sometimes, the interiors too would have little flags, as well as photos of Xi Jinping (often in a traditional Uyghur home), souvenir plates with Xi Jinping’s face, or “ethnic harmony” slogans, such as those calling for all of China’s ethnic groups to be “as tight as seeds in a pomegranate”. Some restaurants even had books in Uyghur about Xi Jinping and the Party at the front counter. I never asked if such demonstrations were voluntary or mandated by the law, but suspect that – like China’s censorship in general – they were a mix of the two (some being anticipatory, some being forced). In at least one instance, I had a friend who worked at a restaurant tell me that it was just a matter of appeasement, which he seemed to see as more of a “so what?” formality. At another restaurant, I had the owner tell me that the police mandated them to sell alcohol, but that his clientele was mostly Chinese anyway, which he seemed to take in a “good riddance” manner – the Chinese clients lingered less and spent more, he said, and weren’t as troublesome as some of the Uyghurs, who might have been thieves or criminals. Throughout major inner-China cities, the clean-up of the local Uyghur criminal scene was a “positive externality” of the policies that some people I talked to praised. However, I still couldn’t help but feel like such praise was never an impartial assessment, but rather a way for the speaker to distance themselves from “the bad Uyghurs in that restaurant” or “the bad Uyghurs in that neighborhood” that they didn’t want to risk being associated with. That plenty of honest people might have been swept up in such judgments was secondary. In a massive game of prisoner’s dilemma, obedience and appeasement appear to have saved some people from camps and prisons, though likely at the price of their less obedient compatriots. Things like money, connections, Han Chinese spouses, and a formal Chinese education – though never an ironclad guarantee – appear to help also. Finally, bribing police or officials to avoid having one’s passport confiscated or to avoid having to return to one’s hometown are an avenue that several of the people I’ve talked to have employed, representing a crack in a system that often feels hopelessly inescapable. For the majority, however, the detentions and the fear of detention have become an unavoidable fact of daily life, and one that has necessitated new coping mechanisms as the people affected face the absurd horrors but nevertheless continue to search for some sort of normality. Most, I would say, cope by simply enduring and “plodding along”. Despite the missing relatives, the financial losses, and the fear that one day it could be their turn to go, many of my friends and acquaintances have done their best to focus on how they earn their livelihood and to continue doing just that. Keeping the pain inside them, they cut their carrots, run their businesses, and sell their wares. For many, what seems predominantly important now is their children’s future. For those without kids, there can exist simple and concrete personal ambitions. One intellectual friend is hoping to continue working at his job and gradually earn enough to purchase an apartment. Recently, he’s also gotten into the habit of going on long walks around the city, he tells me. A younger friend – a university student with a cousin in prison – sat down with me once and told me about how he’s the only Uyghur student in his otherwise Han class. For him, the goal now is to get an internship and to finish his studies, then look for a job. A particularly memorable friend manages a small shop in inner China, where local police have recently confiscated entire shelves of import products for “not having Chinese labels”. He told me that he was able to stop them from confiscating more by telling them that he wasn’t feeling well and had to close the shop. With half the shelves empty and business having seen a sharp decline, he believes that it won’t be long now before the store is closed. But even as he remarks how the policies have started to target young Uyghur men indiscriminately, he says that he’s not afraid, despite being a very young guy himself. At the same time, it’s not as if he’s completely resigned. When talking of the situation in general, he takes a broader, grander view. With praying all but forbidden for the Uyghurs, he tells me that he’s found compromise variations that the authorities won’t notice, such as spreading his legs and praying covertly while sitting in a chair, or praying under one of the trees that line the sidewalk. Some seem to think that a friend or relative will be released soon “because they’ve been held for so many months already”. Few are that courageous, however. For the others, hope exists simply by necessity, with reason an optional second. Of the Uyghurs I’ve conversed with, many have mentioned that “things will get better soon” without offering any logical basis for believing this. Some seem to think that a friend or relative will be released soon “because they’ve been held for so many months already”. Others seem to think that the situation will revert to normal “once terrorism is defeated”. In some of the conversations that I had in inner China’s Uyghur restaurants – which, again, have lost huge portions of their staff – I was told that the staff would “come back soon after finishing their education”. But time has been cruel to these optimistic voices. As the months have turned into a year, the people interned are still interned, the restaurants are losing ever more staff and clients, and the situation only continues to worsen. Sometimes, I still like to imagine that this tragedy is just a bad dream – at some point last year, I tell myself, I must have fallen into the rabbit hole and have yet to find my way out. Everybody bursts out laughing. But then the lights fade, and all that I can hear is the sound of tears. Gene A. Bunin is an independent scholar, translator, and writer, with research interests in science/mathematics and the Uyghur language. He has been researching the language as spoken in the Xinjiang Uyghur Autonomous Region for the past ten years, and has lived in the region for half of that time. AND LIVE CALM IN UIGHUR LAND, WHITHOUT ANY FEAR! ugh thank you so much for this. I truly wish there was something I could do to help. Solidarity with all kitchen workers of the world and with all oppressed people. please continue sharing what you know about this and let your friends in xinjiang know, if possible, that there are people out there watching and listening (whatever that is worth). huge respect for all Uyghurs with their proud and honorable history. This is such a well researched article, and it’s awesome that some of their stories can be heard. By the way, the comment that was just left by “uighur” was not written by a Uyghur. The Uyghurs aren’t afraid of being eradicated as a people group in the future. They’re concerned with the systematic oppression that they’re actually suffering today. Cruel Chinese methods and rules used for the Uygur nation to make them more obedient and “Chinese like” made many Uighurs atheists, there is almost no hope and faith. Uighurs simply scared to live, every single day is another hell for them, as an Uighur, you never know when is your turn to be killed by Chinese government or send to a concentration camp. yes uighurs were a proud and fearless nation! but when there are 10000 chinese behind every single uighur and every uighur is wached by wachdogs and when chinese govenment gathered DNA/blood from 99,9% uighurs in order to sell their organs to potential customers and opened a special terminal in Urumchi airport to organs and “special customers” i.e uighurs which match DNA with a buyer? If you are in fact an Uyghur, I apologise for my last comment. But, you’ve really overstated your case. I’m not saying you’re just telling lies. But, who has claimed that 99.9% of China’s organ trafficking victims are Uyghurs? Yes, it has happened, and Uyghurs are targeted in a special way, and it’s sickening. But, there are also many Tibetans as well as Han Chinese who suffer these crimes. Yes, I agree, violation of human rights imposed not only to Uighurs but also Tibetians,Fun lung followers and some chinese, but most vulnerable minority are Uighurs! due to racial and territorial difference from entire china, Uighurs are a big danger in Chinese government’s eyes. It is all come up since break up of Soviet Union, where all Central Asian republics got an independence and so Chinese is simply afraid ,that Uighurs will rise and require the Uighur independent state, as it was before. So as you see ,there would be a big geopolitical loss, as Xinjiang is a way to Silk Road, and kind of “important port” to Europe , and besides this territory is rich of natural resources, so there is a point ,to eradicate Uighurs in order to have a full right to make a business and give a free place to hundreds of million chinese to make Xinjang a home for them. >The Uyghurs aren’t afraid of being eradicated as a people group in the future. They’re concerned with the systematic oppression that they’re actually suffering today. Uh, why not both? One leads to the other. Or do you think that they can’t hold more than one idea in their heads at a time? Thank you, Gene. I traveled through Turfan, Urumqii, Kashgar, et al. in 1994 on my way out of China after a year spent studying Mandarin in Northeast China. It was a transformative experience for me and I spent grad school studying what I then coined the “Global Uighur Electronic Community” via a number of private chat groups and email lists made up largely of Uighur expats. I most enjoyed interacting with Uighur children in Turfan and Kashgar during my travels and wonder how many of them are currently in camps…or even alive. My heart goes out to the oppressed minorities in xj. When will the world grow some balls and do something concrete to halt this slow motion genocide? So sad to know such stories, but still glad that I read your article. As being a Chinese, I never had a chance to know any of these, from any Chinese public media press. Thank you for the exposure and we all need a truth. I traveled the upper Silk Road with a couple of friends from Beijng to Kashgar in 2007,spending several weeks in Dunhuang, Tulufan, Urumqi and Kashgar. I loved the region. I believe that shortly after we left Kashgar and traveled into Kyrgizstan much of Kashgar was leveled. The official Chinese reason was to prevent Uyghar “terrorists” from hiding in the myriad of passages and lanes. Is this true? Also in your first paragraph you write that Karim’s was “in this large Han-majority city” but don’t identify which city. I’m curious. I’m not sure what that particular instance in Kashgar was like. Much of Kashgar’s old city was gradually leveled over the years for reasons of “modernization” and “safety” (I remember authorities saying that the old houses were not earthquake-proof). Forget if terrorism was ever given as a reason, though it wouldn’t surprise me. what terrorists are talking about? this is all about independance!!!! terrorism was setted up by chinese government in order to kil uighurs!! and finally, how do you believe in CCP information? Last week lawmakers in Gilgit-Baltistan demanded that authorities in China’s Xinjiang province immediately release from detention at least 50 Chinese women married to Pakistani men, some of whom have been held for a year on vague charges of extremism. 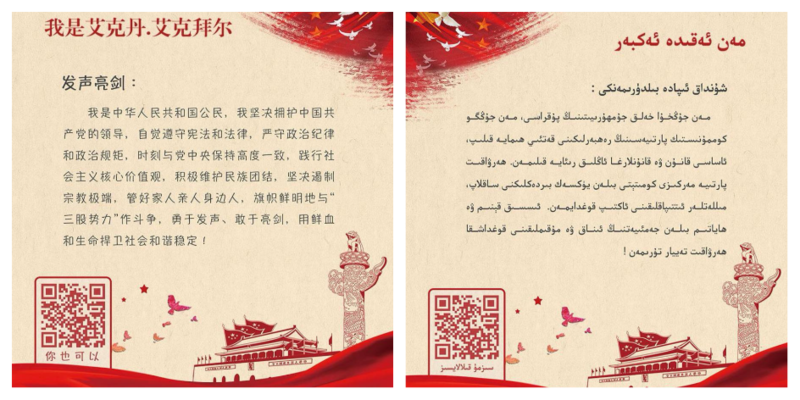 Police officers from local public security bureaus in China have asked French Uighurs to send their home, school, and work addresses, photos, scans of their French or Chinese ID cards, and, in some cases, the ID cards of their spouses and scans of their marriage certificates if they were married in France.